At the sheep sale Saturday, April 6 trade was steady with good quality lambs. Fat lambs sold to £111.50. Fat ewes sold to £130.00 and light weight lambs sold to £4.80ppk. Castlewellan farmer 26kg, £111.50, Dromara farmer 27kg, £108.50, Castlescreen farmer 27kg, £107.50, Ballynoe farmer 26kg, £107.00, Ballykinlar farmer 29kg, £106.00, Downpatrick farmer 29kg, £106.00, Ballygowan farmer 29kg, £106.00, Crossgar farmer 24kg, £105.00, Ardglass farmer 26kg, £105.00, Killinchy farmer 29kg, £105.00, Saintfield farmer 28kg, £104.50, Hillsborough farmer 27kg, £102.50, Annalong farmer 26kg, £101.00, Ballyward farmer 27kg, £101.00, Ballynahinch farmer 24kg, £98.50, Comber farmer 23kg, £97.00, Downpatrick farmer 24kg, £97.00, Downpatrick farmer 25kg, £97.00, Dundrum farmer 22kg, £95.50, Strangford farmer 19kg, £78.00 and Tobercorran farmer 16kg, £77.00. Newry farmer £97.00, Downpatrick farmer £95.00, Ballynoe farmer £95.00, Ardglass farmer £94.00, Legamaddy farmer £91.00, Killinchy farmer £82.00, Ballygowan farmer £80.00, Crossgar farmer £80.00 and Ardglass farmer £80.00, Ballykinlar farmer £76.00, Newry, Ballynahinch, Clough and Downpatrick farmers £70. 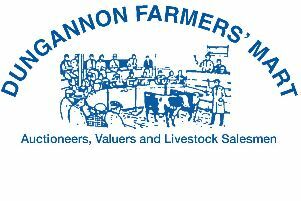 Ballynoe farmer £190.00 and Downpatrick farmer £165.00, £156.00 and £142.00.